This beautiful, contemporary sterling picture frame by Cunill is coated with tarnish resistant lacquer and backed with a wooden easel. 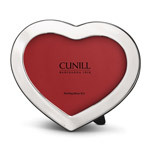 The Heart picture frame is crafted of high quality sterling silver in Italy. Please note there is a small sterling hallmark on the botton left hand corner of the frame.